We’d love your help. Let us know what’s wrong with this preview of A Technique for Producing Ideas by James Webb Young. Since its publication in 1965, A Technique for Producing Ideas has helped thousands of advertising copywriters smash through internal barriers to unleash their creativity. Professionals from poets and painters to scientists and engineers have also used the techniques in this concise, powerful book to generate exciting ideas on demand, at any time, on any subject. Now let James Webb Young's unique insights help you look inside yourself to find that big, elusive idea--and once and for all lift the veil of mystery from the creative process. "James Webb Young is in the tradition of some of our greatest thinkers when he describes the workings of the creative process. The results of many years in advertising have proved to him that the key element in communications success is the production of relevant and dramatic ideas. He not only makes this point vividly for us but shows us the road to that goal." To ask other readers questions about A Technique for Producing Ideas, please sign up. The basic argument of this book is very simple: "ideas" are new combinations of old elements— facts, images, etc.— and that a creative person is one who is readily able to see relationships between such elements and so find new ways of combining them. The "technique" Young describes is also very simple, and rather common-sense: learn as much as you can, both about the specific thing you are working on and the world in general (because more facts in your head equals more possible relationships an The basic argument of this book is very simple: "ideas" are new combinations of old elements— facts, images, etc.— and that a creative person is one who is readily able to see relationships between such elements and so find new ways of combining them. The "technique" Young describes is also very simple, and rather common-sense: learn as much as you can, both about the specific thing you are working on and the world in general (because more facts in your head equals more possible relationships and combinations); think about all of it for a while, then take your mind off of it completely and do something else, and an idea will probably emerge as if out of nowhere; and finally, edit— revise, sharpen, and develop the idea until it works for the purpose at hand. The simplicity of that is, I guess, a good thing, but it also doesn't strike me so much as a "technique" as, well, being in the world. Young does suggest the use of index cards (or, presumably, an electronic equivalent) for recording facts and keeping them straight, which is probably a useful reminder of the importance of notes. I also very much liked his emphasis, reiterated at the end of the book, on the importance of general knowledge and a broad range of interests; you can't limit yourself to learning only what is practically useful for you, because you don't actually have any idea of what that will be. But I did wish for something just a little more concrete for putting all of this into practice. A short book with a big idea--that's it's possible to follow a step by step process in generating and developing ideas. Young is an advertiser, and the book is aimed primarily at advertisers, but it's useful for anyone in a creative field who wants to focus on the process of coming up with ideas. The process is five-step: 1)gather material for ideas; 2) chew on the material to look at relationships; 3)put everything aside to let the material percolate; 4) wait for the idea to come up; 5) fit the A short book with a big idea--that's it's possible to follow a step by step process in generating and developing ideas. Young is an advertiser, and the book is aimed primarily at advertisers, but it's useful for anyone in a creative field who wants to focus on the process of coming up with ideas. The process is five-step: 1)gather material for ideas; 2) chew on the material to look at relationships; 3)put everything aside to let the material percolate; 4) wait for the idea to come up; 5) fit the idea to the real-world circumstances. This technique is simple but effective, and is worthwhile for anyone struggling to get ideas. It's like a checklist you can use to put the idea back on track--have you researched enough material? examined the idea from all angles? put things aside for a while for the subconscious to work? My favourite part of the book or booklet (because it's so short) is the suggestion to get "those little 3 x 5 ruled white cards and use them to write down the items of specific information as you gather them. If you do this, one item to a card, after a while you can begin to classify them by sections of your subject." I also liked his likening of ideas to atolls (works for icebergs too but atolls sound cuter), where you only see only the brilliant idea at the top but not the str Good to have/read. I also liked his likening of ideas to atolls (works for icebergs too but atolls sound cuter), where you only see only the brilliant idea at the top but not the strategy, planning and other idea-building processes beneath it. Edit: Reading this article on Brainpickings about Young's book should suffice. It's (almost) as good as reading the book itself. Do you wish that authors would stop padding their stories and ideas with unnecessary bumpf? That lovely word originated in WWII when English soldiers were overwhelmed with unnecessary printed materials, and used them as toilet paper or "bum fodder." Even excellent and important books would be unarguably better in a slim volume, rather than a massive tome. A Technique for Producing Ideas, supremely bumpf-free, is just such a volume, elegant and beautiful in its simplicity, and profoundly true. Ja Do you wish that authors would stop padding their stories and ideas with unnecessary bumpf? That lovely word originated in WWII when English soldiers were overwhelmed with unnecessary printed materials, and used them as toilet paper or "bum fodder." Even excellent and important books would be unarguably better in a slim volume, rather than a massive tome. A Technique for Producing Ideas, supremely bumpf-free, is just such a volume, elegant and beautiful in its simplicity, and profoundly true. James Webb Young, an ad man of the 1940s, put some thoughts about creativity together on a Sunday afternoon for a Monday advertising class at the University of Chicago. Retired to New Mexico by 1960 (because his name was unsuitable for go-go era ad men*), he turned those thoughts into a book. It became a McGraw Hill Advertising Classic, enduring forewords by two great ad men of later eras, Bill Bernbach and Keith Reinhard (whose names were suitable), and it remains proudly in-print to this day. Even now, when ideas are associated with tech entrepreneurs rather than ad men, and everything is tested ad nauseam by Google and Facebook, the truth of his five simple steps is more valuable than ever. For months now, I have been stuck on an article about consciousness in artificial intelligence. I started writing it on Medium, but stopped. Reading about step three of the technique, I jumped up from the kitchen table, found some 3 x 5 index cards as Mr. Webb suggested, and distilled the very powerful essence of my article in thirty minutes. This book may change my life. Let it change yours! 1) Gathering of raw materials - both the materials of your immediate problem and the materials which from a constant enrichment of your store of general knowledge. 2) Working over of these materials in your mind. 3) Incubating stage, let something beside the conscious mind do the work of synthesis. 4) The actual birth of the idea, "I have it" stage. 5) Final shaping and development of this idea to practical usefulness. 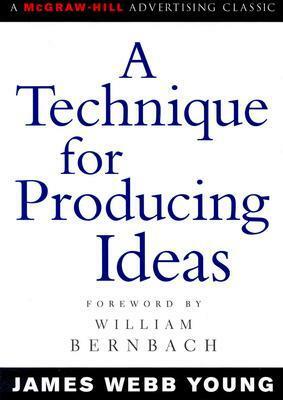 A very short and concise book on how to produce ideas. One can even consider it as a long article. The author talks about two main principles behind generating new ideas ( (a) an idea is a combination of old components, and (b) the capacity to bring old elements to a new one depends on the ability to see relationships) and introduces five methods to achieve that. Those methods are not surprising. You probably heard about them and may even perform some of them regularly. What *might* be different f A very short and concise book on how to produce ideas. One can even consider it as a long article. Those methods are not surprising. You probably heard about them and may even perform some of them regularly. What *might* be different from your usual practice is that he gives a specific 5-step procedure to do so. And he claims that it works. Does it? You should know that this is not a scientific book. James Webb Young did not conduct any scientific study on how creativity works. There is no experiments, there is no randomized trial, no statistical significance, nothing. He wrote the book based on his own experiences and introspection. You should keep that in mind. Short and incredibly to the point. Loved it. I took a course in creativity at UCLA which was 10 weeks long and frankly, this book encapsulated the 10-week course well. I've posted on amazon a review but basically where I think people have issues with this is in the incubation phase - we have a hard time just letting go and "allowing" good ideas to come to us. I know I struggle with this part, and I know I'm not alone. But when I can let go, I'm amazed and it's always a situation of taking the show Short and incredibly to the point. Loved it. I took a course in creativity at UCLA which was 10 weeks long and frankly, this book encapsulated the 10-week course well. But when I can let go, I'm amazed and it's always a situation of taking the shower, or traveling somewhere, or doing something repetitious or mundane - when the "a ha!" will arrive, almost fully formed and ready to be acted on. I have now read this book twice (not that hard as it's about a thirty minute read). Like Paul Arden's book "It's Not How Good You Are, It's How Good You Want To Be", I found this book to be incredibly inspiring for the creative process. Also, I find it serendipitous that in this week that I've devoted to "Filling The Well" (something I do quite often in my quest for inspiration via the spark that museums, movies, books, galleries, etc. almost always provide) I stumble upon a book that is exactly I have now read this book twice (not that hard as it's about a thirty minute read). Like Paul Arden's book "It's Not How Good You Are, It's How Good You Want To Be", I found this book to be incredibly inspiring for the creative process. Also, I find it serendipitous that in this week that I've devoted to "Filling The Well" (something I do quite often in my quest for inspiration via the spark that museums, movies, books, galleries, etc. almost always provide) I stumble upon a book that is exactly about that! "An idea is nothing more than a new combination of old elements." Don't read about advertising, read about social sciences/psychology. Quick, simple, and short read. I suggest everyone take half an hour to an hour to read through this book, especially if you're interested in the creative minds' process. Challenging yourself to think like this could create some really unique ideas. You remember how Sherlock Holmes used to stop right in the middle of it case, and drag Watson off to a concert? That was a very irritating procedure to the practical and literal-minded Watson. But Conan Doyle was a creator and knew the creative process. A simple 5 step plan to generate new ideas. It's nice to believe that there's a method to finding the perfect solution to any creative problem, and although it's not that simple, but this method is tried and tested and proven to be the best. The advertising classic. You can read it in an hour. It is still insanely useful and valuable. A must read for all creatives. "Words being symbols of ideas, we can collect ideas by collecting words." In his last year as an advertising agency executive, James Webb Young was taking an apparently urgent meeting with a client at a well-known magazine. It turned out that the magazine had decided that their future strategy should be to “sell ideas”. However, after that they got stuck and now they turned to Webb with the question: “You have produced a lot of advertising ideas. Just how do you get them? The boys are waiting for me to come back to tell them.” Totally unprepared for the topic at hand In his last year as an advertising agency executive, James Webb Young was taking an apparently urgent meeting with a client at a well-known magazine. It turned out that the magazine had decided that their future strategy should be to “sell ideas”. However, after that they got stuck and now they turned to Webb with the question: “You have produced a lot of advertising ideas. Just how do you get them? The boys are waiting for me to come back to tell them.” Totally unprepared for the topic at hand and with no formula to share Webb had to disappoint the client, but even though he at the time thought the question funny and naïve it stuck and over time Webb realized that there actually is a technique for producing ideas. The resulting formula was later on presented for graduate students in advertising at the University of Chicago and for advertising practitioners. The presentations subsequently became this book published in 1965. According to Webb there are two principles that are the source of ideas and then a method by which ideas are produced. The first principle is that an idea is a new combination of old elements. The second is that a person’s capacity to create these new combinations of old elements depends on his ability to see relationships – making the habit of mind to search for relationships between facts an important and trainable aspect in the production of new ideas. Further, the technique to generate ideas follows five distinct steps in a definite order. 1) The first step is to gather the information that makes up the raw material for the idea. The material is of two kinds, the specific and the general. The specific material concerns the particular facts on the topic at hand. In advertising it could be facts on the product, the target customers etc. The general material is the vast databank of information on the world that is needed to come up with the elements that combined produce a new idea. To be able to generate creative ideas a person needs to be curious of the world and constantly browse and make the cumbersome effort to add interesting concepts of life and events to his databank. The more facts of seemingly little practical use that are stored the more new combinations are possible and the easier to generate ideas. A person should always try to enrich his store of general knowledge. 2) The next step is to chew the material, analyze it, break it down into pieces, look at it from different angles and try to understand the problem you are going to solve. In this stage you are seeking a synthesis to make up that new combination that will be your idea. It’s important to be open-minded and take notes of all the partial thoughts and ideas that come up. 3) The next stage is counter- intuitively to drop the issue and turn the problem over to your unconscious. A tired mind under stress will not be as creative as one that is relaxed and stimulated. Hence, listen to music, take a walk with your wife, go to the movies and let the mind digest the issue you are trying to solve. 4) Hopefully, but not inevitably as people differ in creative ability, in the forth step an idea will appear as from nowhere perhaps when in the shower, when you are half awake in the morning etc. Be sure to write it down immediately. 5) In the last stage the idea has to be tested with other persons. Submit it to criticism and let others improve on it and add qualities that might have been overlooked. This will develop the idea to be of practical use. This is the whole method and according to the reactions Webb has received from readers over the years it works. Now, Webb’s book is very short and as such adds almost no additional depth to the method beyond what’s been included in this review. On the one hand the book delivers on its aim in a believable and persuasive way. It also interestingly ties in to Charlie Munger’s concept of storing a number of “mental models” of the world. On the other hand its contents could easily be summarized on one power-point slide without missing much level of detail. Interesting read, Ideas are just new combinations of old elements, and the ability to see relationships between these old elements determines your ability to produce ideas. to produce an idea you have to go through five stages, the first stage is “ raw material gathering” which means gathering specific and general knowledge, specific knowledge is collected by studying, comparing and finding differences while the general knowledge is just to be interested in general subjects or discussions that co Interesting read, Ideas are just new combinations of old elements, and the ability to see relationships between these old elements determines your ability to produce ideas. to produce an idea you have to go through five stages, the first stage is “ raw material gathering” which means gathering specific and general knowledge, specific knowledge is collected by studying, comparing and finding differences while the general knowledge is just to be interested in general subjects or discussions that could have direct or indirect relationships with your specific knowledge. In this stage partial ideas will come to the surface, when you have the partial ideas, you’ll try to give them a shape and this process is the hardest, you have to keep this partial idea in your mind in everything you do in your day trying to find something that can fit with it, until you get very exhausted and you decide to drop it. Third step is doing nothing at all, dropping the whole subject from your mind, and here where the magic happens, Sigmund Freud asked a question: where does a thought go when it’s forgotten? It goes to the unconscious mind which will do the job while you sleep, so drop the whole thing and do what stimulates your emotions. music, movies, camping, etc. The next step depends mainly on your efforts in the previous steps, did you gather the knowledge? Did you try to keep thinking about it and looking at it differently until your mind wanted to explode? Did you drop it and sent it to the unconscious mind? If the answer is yes, the solution or the missing piece might find you when least expected, when you are watching a movie or speaking with someone or any other daily activity, its just going to be “i found it”. 1. Gather raw material, both specific and general. a. Specific: Intimate knowledge of product and consumer. Go deep to figure out the differences. b. General: Read widely. Be interested in knowing a little about a lot of different topics. 2. Constantly think about the idea. a. Work over the materials in your mind. b. Turn them this way and that. c. Work toward patterns and connections and relationships. d. Think of all the pieces as a giant puzzle that you need to put together. i. Write down any partial ideas that come to you. e. Keep doing this until you feel totally stuck. 3. After you get totally stuck, do something else creative to let the ideas germinate. 4. Give birth to the idea when you least expect it. Nothing about this book will blow your mind, and for many people that will be a disappointment. It simply lays out five simple steps for generating ideas—steps that sound more like work than wizardry. Most of the steps are so obvious that it's tempting to dismiss them, and it is because the steps are so easily dismissed that good ideas are rare. Most people can't consistently generate great ideas precisely because they attempt to skip one or more of the steps—or they overlook them altogether. I'v Nothing about this book will blow your mind, and for many people that will be a disappointment. It simply lays out five simple steps for generating ideas—steps that sound more like work than wizardry. It's a very thin book and wouldn't hurt to spend a few hours to read it. Simple, clear about the five steps of producing idea. Needs to be applied into practice though. I think it would be better if Young can provide more specific examples of successful advertising ideas. And one thing is that I can't find detailed story about Young's successful advertisement work online? Is it because it's too long ago? Five very natural and organic techniques to generate ideas. The first one 'gathering information,' I think, is the most crucial of all because it requires 'accurate thinking' and 'controlled attention' as profiled in Laws of success by Napoleon Hill. To accomplish this step, extensive and in depth reading is required, and of all skill going extinct, reading is at the top. No wonder very few leaders have ideas to succeed in their positions! Yet another "meh-like" book. I believe that author is very experienced ad-man for decades but he unfortunately, doesn't show his talent through the book; also he confess that in the first pages as well. This is like a initial book of ad-industry to make a generic way of producing ideas which may not work in current circumstances. An easy read that teaches the art of coming up with ideas. It takes some mental work to dive fully into the concepts and not just read the words. The Index-card method is my favorite. I’ve heard that Robert Green and Ryan Holiday use it for generating ideas for their books. This isnt ground break and most people will know that this is the wany they generally come up with ideas. What it is good at doing is really making clear the steps that people need to/will go through when coming up with ideas. 45 dakika gibi kısa bir sürede bitirdim. İnce bir kitap. Yazıldığı tarihe bakıldığı zaman biraz geri kalmış. Aslında bizim kuşağın genel olarak bildiği fikir bulma tekniklerinden bahsediyor. Ancak bu konuda daha önce hiç bilgi sahibi olmayan için faydalı bir kitap. Finished this in under an hour and definitely the shortest book I’ve read. Actually, it feels more like an article than a book - only 36 pages. However, the idea producing concept is great and it feels like much more could have been written on the subject. James Webb Young (1886-1973) was an American advertising executive who became First Chairman of The Advertising Council. He was inducted in the American Advertising Federation Hall of Fame. Young received many honors and awards including the Advertising Man of the Year Award in 1946.